Mulhern is originally from Maryland, right outside of D.C. He grew up visiting the National Gallery and quickly fell in love with painting, studying artists such as Turner, Van Gogh, Rothko and other great masters. On the way home, he would stare at the street art on the subways and often paint in his head. 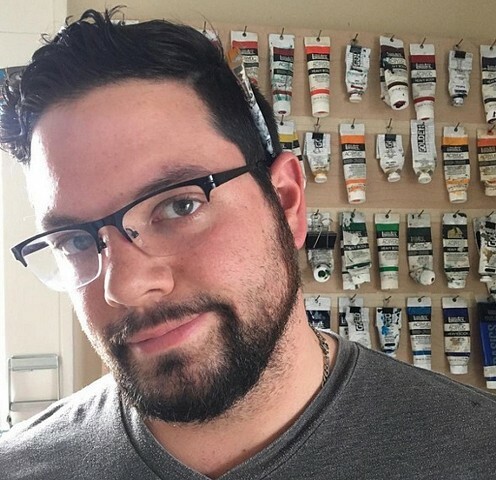 He received his BFA and MAT/MFA in painting and education from The Maryland Institute College of Art (MICA). After completing his education, Mulhern worked as a sculptor, painter, and professor in Baltimore. He also designed educational programming for the Walters Art Museum and acted as a teaching mentor to seniors at MICA during his graduate school years. In 2008, Mulhern moved to Brooklyn, New York. There he joined a metal guild and started his own artist studio, where he taught studio art and sculpture. While there he started creating his now known professional work. From 2009 to 2011, Mulhern worked as a studio artist and professor in Manhattan. In 2011, Mulhern moved his studio to Long Island to continue his work as a professional artist and art professor. He is currently a professor and director at Ross School in East Hampton, NY, where he was formerly an artist in residence. His work has been exhibited at many galleries including the Peter Marcelle Project, Sara Nightingale Gallery, Art Southampton, Guild Hall, Southampton Art Center, and George Billis Gallery in Chelsea, New York. Mulhern’s most recent group show included Jackson Pollock and Ellen De Kooning; he was very honored to show along side them and to be included as the youngest artist in the show. Mulhern is very quickly becoming known throughout the East End, Long Island and in New York for his impressive work.